The B&B Episcopo Lipinsky is situated between Piazza di Spagna and Piazza del Popolo, Via Margutta one of the most private and characteristic streets of the center of Rome. 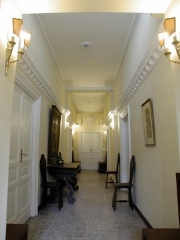 You will stay in a evocative building of the 19th century with its artists studios, courtyards and little gardens. Our enchanting terraces and wonderful panoramic views will give you the sensation to live in a park even though it's in the center of the city. You could enjoy of a walk trough the town to admire the most famous monuments, museums, art galleries or fashion designer shops of the world. We offer you two charming suites, equipped with all comforts, as: air conditioned,satellite tv and safe, bathrooms with shower,hair-drier and fine linens. In this magnificent and quiet location plunged in the green of the contiguous Villa Borghese you could enjoy by a buffet breakfast in our breakfast room "Capri", in the roof garden "la Terrazza del Glicine" or if you want on the delicious balconies. The Suite La Circe is composed of a sitting room equipped with air conditioned, telephone, satellite tv and safe; in the bedroom you can find air conditioned, telephone and satellite tv too. Both the sitting room and the bedroom have a big window that open to a balcony towards the courtyard full of trees, palms and a more than a century old wisteria and view to Villa Medici.The environment is quiet classic and elegant, the colour of the wall painting, ancient pink, is resembling to that of tapestry.